Enjoy Char Siu Pork like you’d get in a Chinese restaurant with recipes made in the slow cooker or the Instant Pot so you can make it at home! Click here to PIN Three Excellent Recipes for Char Siu Pork! Char Siu pork is the Chinese version of barbecued pork, and this is something many people love to order in a Chinese restaurant. The sweet and salty flavor is fantastic, and the meat is tender and juicy, which is why we picked this as a Friday Favorites recipe idea! We’ve updated this post to include Slow Cooker and Instant Pot Char Siu Pork Recipes and we’re confident whichever method you choose it will win over your family. Enjoy this juicy and crispy pork served in a lettuce wrap, or with rice and veggies; dress it up any way you like! Don’t you love it when you can make one of your favorite restaurant dishes at home? I love how Andrea was able to get these crispy ends in her recipe Slow Cooker Char Siu Pork Roast from Andrea’s Recipes. Doesn’t this look delicious! From Eating Well, this Slow Cooker Char Siu Pork is packed with flavor and simply served. An excellent weekday meal! 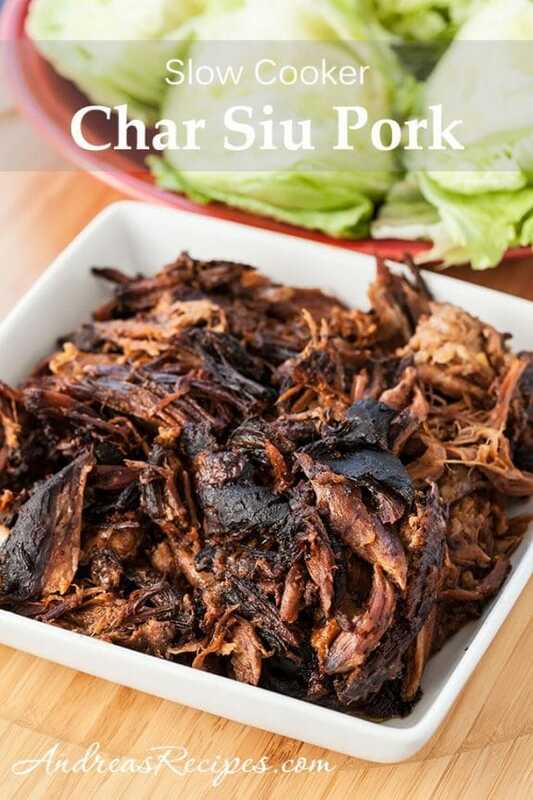 This Instant Pot version, Char Siu in the Pressure Cooker from Christine’s Recipes has a much shorter cooking time and the end result is tender and juicy pork. A perfect meal your guests and family will love!